Lakanto® is a no-calorie sugar substitute with a taste you'll love! It's a lot like raw sugar, but with one big difference: its zero calories and zero glycemic index won't affect your blood sugar levels. Lakanto® is ideal for diabetics and can be used just like regular sugar '– it adds delicious sweetness to coffee or tea, baked goods, fruit salads and much more! Ingredients: Luo Han Guo (pure extract) and Erythritol. Lakanto® is an all-natural “sugar alcohol” (or polyol) produced through a fermentation process and has been approved for use as a sugar substitute in the United States and throughout much of the world for years. Lakanto® is produced via natural fermentation of certified Non-GMO corn. Lakanto® is made by Saraya Co., Ltd, a Japan-based international health and environmental company. In 1995, Saraya developed a white natural sweetener by adding a high purity extract of the Chinese fruit luo han guo to erythritol, a sugar alcohol made of fermented glucose. The resulting sweetener has absolutely zero calories and a glycemic index of zero. It closely matched the sweetness profile of table sugar and could be used in cooking, baking, coffee and tea. It didn"t cause cavities or tooth decay, and best of all, it contained no additives and tasted great! 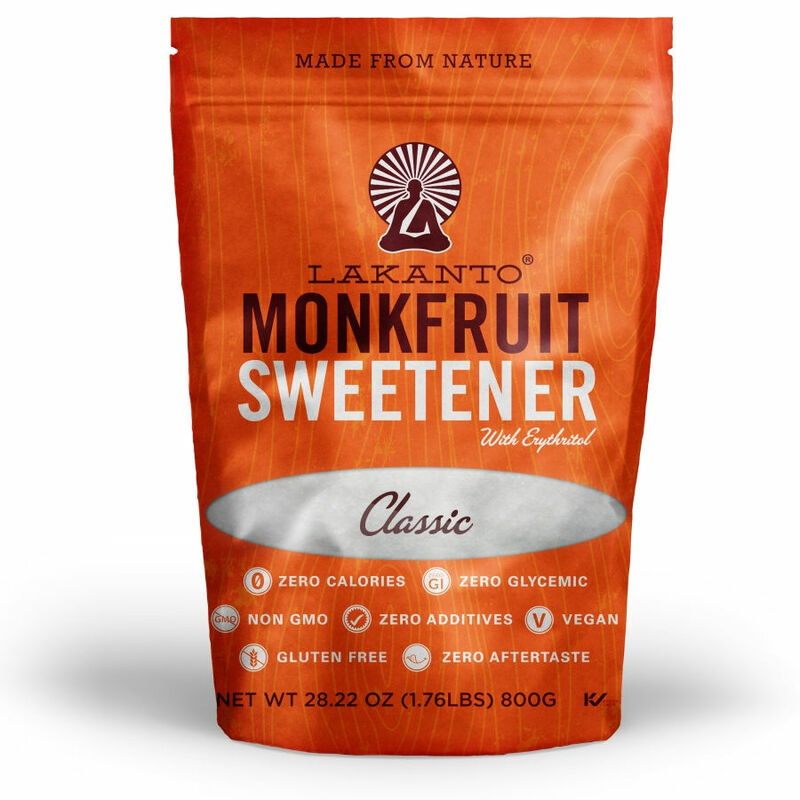 They called this sweetener Lakanto®, Japanese for 'sweet fruit." Over the next decade, it became the #1 selling natural sugar substitute in Japan. Fourteen years later, it is still going strong and remains the only sweetener that combines luo han guo extract and erythritol. Luo Han Guo is a rare medicinal fruit found primarily in the Guangxi Zhuang province of China. Most fruits, like apples and cherries, get their sweetness (and calories) from sugars such as fructose and glucose or sugar alcohols such as xylitol and maltitol. Luo han is unique '– its sweet taste comes from a very different substance called mogrosides, which tastes extremely sweet and contains no food energy. This zero calorie sweetening component makes luo han popular among diabetics worldwide. However, blood sugar management is only one of the many special uses for luo han guo. The earliest recorded medicinal use of luo han fruit dates back some 800 years to the Song Dynasty. In Traditional Chinese Medicine (TCM) it is known as a powerful "cooling" herb, useful for balancing excess heat in the body, a condition believed to disrupt the body's energy system and cause discomfort and a host of symptoms. Some common uses in TCM for luo han are for coughs and bronchitis, to relieve fevers and sore throats, and to ease constipation and gastritis. Recent research indicates luo han as a powerful antioxidant as well. The plant is considered a Chinese national treasure so it's illegal to carry any part of the plant, including the raw fruit and seeds, outside of China. Guilin remains one of the few places that grows Luo Han. During the Tang Dynasty (618AD-907AD), Guilin was a hotspot for Buddhism and home to many temples and a large monastic population. In India, advanced Buddhist practitioners are known as arhats. In China, they are called the luo han. Somehow, the unique fruit of the area became associated with many Buddhist masters living there! Indeed, the Song Dynasty records reveal that monks brewed the fruit for medicinal tonics. 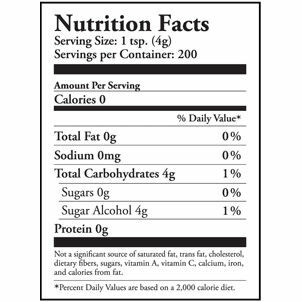 Erythritol (pronounced i-rith-ri-tol) is a sweetener that has zero calories, zero glycemic index, and is about two-thirds as sweet as sugar. Erythritol has long been a part of the human diet. It occurs naturally in many fruits such as grapes, melons, and pears and fermented foods such as wine, cheese and soy sauce and is naturally present in other sources like mushrooms and lichens. Suggested Usage / Storage: Lakanto® can be used to replace sugar on a one-to-one basis, meaning if a recipe calls for two tablespoons of sugar you can use two tablespoons of Lakanto® for the same sweet taste. Store in a cool dry place.